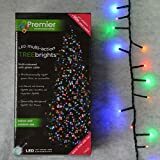 Decorative Xmas tree lights: 33ft/10m, 100 LEDs, portable to wrap anywhere you want. 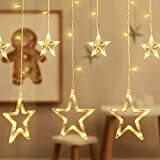 2 lighting modes available: steady on & twinkle/flash, perfectly meet your decorative lighting needs. IP44 waterproof rating protects the bulbs from splashing water on all side, allowing to use it outdoor. 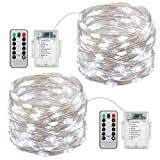 Multi-application: living room, dining room, bedroom, weddings, party, Festival, Halloween, Xmas, etc. Kindly Note: Powered by 3 AA batteries (NOT INCLUDED); Remote Control (NOT SUPPORT). 8 MODES: 8 options of lighting mode and 10 kinds of light brightness can choose, there must be a kind of light made to make you satisfied. Greate ideal ambience, all is on your control! TIMING FUNCTION: To avoid forgetting to turn off the lights, you can set timer, the fire lights will be 6 hours on and 18 hours off per day. This function help you do a control. 13 KEY REMOTE CONTROL: Wireness remote control, effective receiving range is 5meter, including 8 modes choice: Combination,wave,Sequential,Sloglo,Chasing/Flash,Slowfade,Twinkle/Flash,Steady on. 2 brightness adjustment keys(+/-),Switch keys (ON/OFF), Timer key, Just one button to get your favorite light mode. 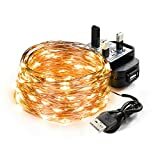 IMPROVED WATERPROOFNESS: This led string light with IP65 Waterproof Copper Wire and Battery Case is designed to be used outdoors. Perfect use of outdoor, fireplace mantels, patios, balconies, boat decks, wedding etc. 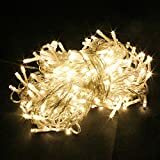 HIGH QUALITY COPPER WIRE: Each string lights are made of 2 high flexible copper wires, so it never mess and can be easily bended any shape you want, 50 led bulbs/16.4ft,with timer function and brightness control, it is not overheat after many hours of use, it will light up your life. Low Voltage Kids Pets Safe Design. Low power consumption. Net Size: 2m*3cm. Multi Colours. Lights changes between different colours. Looks Fantastic! Can be hung on walls, windows, doors, ceilings, Christmas trees. 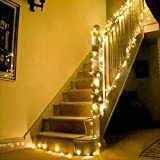 Efficient lights that use 90% less energy than traditional fairy lights. LightsGo branded. Proper Made! CE Passed. Waterproof, can be used indoor and out.Your Safety is Our Priority! 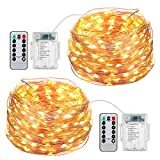 Energy efficient: Comes with 500 leds, total power 6w, with high electric energy convert rate, no heat energy consumption. Energy saving and safe for using. Memory function: The controller can memory the last setting after unplug the adapter.Easy to use: directly plug in and unplug it for power on and off. UK standard,voltage 240v, with just one button for modes switch. 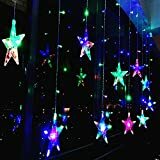 Popularly used for decorative - party, wedding, home, window, bathroom, festival, Holiday, shows, restaurant, hotel, commercial building, shopping center, shopcase, pub, club,concert, hall, cabaret, fashion show, dance, stage, etc. 1. 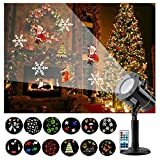 PANORAMIC MOTION PROJECTOR: Wall decoration light, white snowflakes moves automatically, light projector transforms any house or room and make more fun for outdoor holiday display, your party, festival and family party. 2. 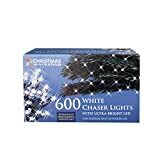 WEATHER-RESISTANT & WATERPROOF: White Christmas snow moving landscape projection light could be used for outdoors in dry, damp and wet location. Weather-resistant cap to help protect the connection from the weather. 3. MORE BRIGHTNESS & DURABLE: High quality material and brighter LEDs. Soft LED light could protect eyes as night light for baby kids. 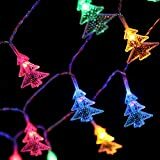 specially designed for Christmas, New Year, Valentines, Birthday, Party and Holiday, etc. 4. 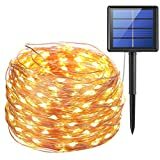 LOW VOLTAGES & IRRADIATION DISTANCE: UK adapter 12V DC, about 12ft * 12ft, 6.6 feet cable and 20 feet cable connect with the light using more flexible. 5. EASY TO USE: Just plug it in ground and adjust the beam angle; Then connect it with power. 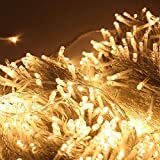 10 meters durable and flexible high quality soft copper wire which can be be easily bended and shaped around plants, house ,signs, furniture and something else.Ideal for Party and holiday decoration. 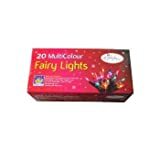 100 particles 2700-2900K warm colourful Mini Led Lights are bright enough to illuminate any dark corner, or create a romantic setting. 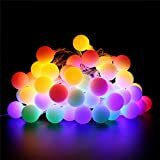 These lights are perfect for spicing-up your décor or setting the mood for a party. Great for use in a restaurant ,house or yard. 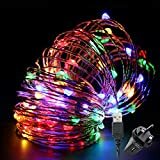 Low power consumption & heat insulated copper wire; IP67 waterproof rate which is perfect for indoor and outdoor decorations. 12 Month Product Guarantee, 30 Days Money Back Guarantee.If you have already exceeded this period, please contact us without hesitation, we can also offer you 100% satisfcation. TIMING FUNCTION: To avoid forgetting to turn off the lights, you can set timer, the fire lights will be 6 hours on and 18 hours off per day. This function help you do a control.l. 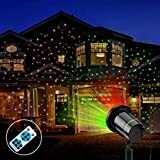 200 SUPER BRIGHT LED LIGHTS: With 200 LED, this Amir Solar String Lights is wonderful and good ideal for decorating your gardens, patio, lawn, porch, gate, yard, etc, which will always meet to your demand. 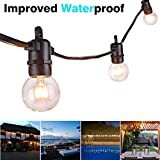 WATERPROOF IP 65: Amir solar string lights is designed to be used outdoors, even in the rain day, you can still see the romantic light spinning from of your eye in. Not overheat because of the copper wiring is insulated. 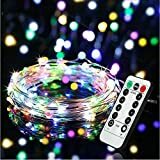 8 IN 1 DESIGN: You can control the string lights easily with 8 modes and different brightness level by the two buttons back of the solar panel. About: Combination，Fireflies flash，Waves，Fade，Marquee，Slow Fade，Twinkle Marquee，Steady. 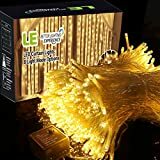 72 FEET LENGTH + 22M: Solar Fairy Lights on 72 Feet Long Ultra-Thin Copper Wire, which is simple and easy to use. The copper wire light is durable enough to design any shapes you've been dreaming of. SOLAR POWERED: This Light does not need battery replacement and charge even on cloudy days. 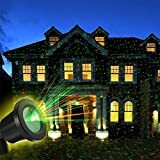 Turn on automatically at dusk with bright light color. Have best performance when you place it in an open area with direct sunlight most of day. It can work up to14 hours after fully charged (8 hours). 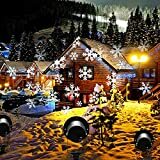 Ease of Installation and Easy Setup: You can easily install without having to spend a lot of time to enjoy the festive atmosphere of the landscape lights. Water and Weather Resistance: indoor or outdoor year, IP65 waterproof, can withstand all kinds of weather to the interference caused by the lamp. Energy Saving and Timing: ON / OFF can help automatically turn on and off, making it easier to use and save 99% more energy than traditional strings. 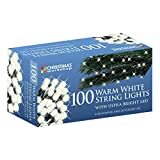 Support Places: Apply to holidays, gardens, parks, house facades, holiday trees, bands,pubs,clubs, roller skating rinks, KTV, family gatherings, creating a perfect lighting effect for your event and a strong atmosphere. 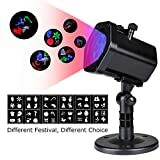 Multiple Color Modes:landscape projector lamp with flashing red, flashing green, red&green lighting, providing a magical sparking atmosphere green, moving automatically, take more fun for someone party, festival and family party, more than 3000 star point. 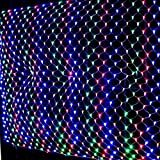 【12 Replaceable Slides】The projector light can project 12 kinds of dynamic patterns, including Christmas, Halloween, Thanksgiving, snowflakes, leaves and other different patterns, you can switch any of your favorite patterns. 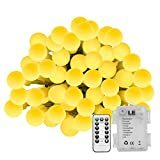 【Intelligent Remote Control】You can self-select 1-6 hours sleep,you can also cancel the timer.You can use the remote control to select the lighting mode you want, dynamic or static, fast or slow to move. 【2 Ways of Flexible Installation】360°adjustable projection angle,the design of the two bases, you can use indoors or outdoors, no venue constraints.200 square feet projection coverage .Project range is about 10 to 16 feet from the projection surface, adjust the distance to display pattern according to your need. 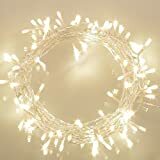 【Multi-use】Suitable for Christmas, wedding decorations, parties, birthdays and gardens, for your activities to create a romantic and warm atmosphere. 【Safe and Waterproof】LED cold light, harmless to the human body. The projector light is made of IP65 waterproof material, power cord is made of IP44 waterproof material,Please do not immerse the product in water or heavy rain. 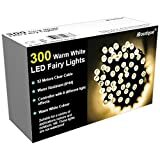 LED Fairy Lights: Micro Bright 40 Static Warm White LED Fairy Lights to give a warm soft glow. 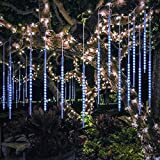 Fairy String Lights: Lit Length of 6m/19.7ft with 2.5m/8.2ft Lead Cable. Distance between each star 14cm/5.5inch. Diameter of clear star 1.4cm/0.5inch. Flexible Wire: The ultra thin silver wire is bendable and sturdy. 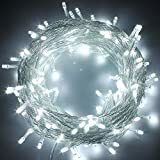 Ideal for wrapping,shaping and getting creative led decoration. 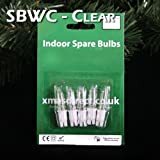 USB Powered: This christmas string lights is powered by usb, can get access to a mains plug with a usb port, a usb port on a laptop, computer, power bank or power strip. No need to buy batteries and frequently change batteries to run it. 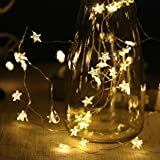 Starry String Lights: Decorate anything you want to highlight,such as jar, flower, fireplace, bedroom, tree, border, contour lighting, use it creatively with DIY. If you have any questions do not hesitate to contact us at first time, we will offer refund or replacement service. 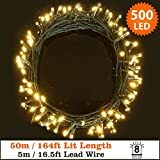 FAIRY CLUSTER LIGHTS: 480 LED Warm White Cluster Indoor and Outdoor Fairy Lights ( 6m / 20ft Lit Length ) with 10 metre Lead Wire. 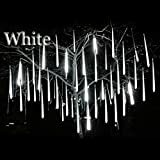 Cluster LEDs combined with Warm White magic provide a visual treat. 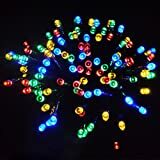 LED FAIRY CHRISTMAS DECORATION CLUSTER LIGHTS: Cluster lights are ideal to give your decorations a welcoming glow. 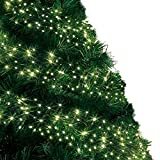 Green cable not only blends beautifully to your Christmas tree and Garden decoration but also adds on to the visual display to your Festive, Wedding/Birthday Party or Bedroom decorations.